tcnorris: Ontario election: time for a change/ can Hudak win? Ontario election: time for a change/ can Hudak win? A recent Ipsos poll reported that 72% of Ontarians think it is time for a change? The results of this online survey were duly reflected in blogs and the Twittersphere. There can be little doubt that the finding is important, but it is not conclusive. Time for a change sentiment can become the dominant consideration in determining vote outcomes, but other matters are potentially equally or more important. We need look no further back than the 2013 B.C. election, when this Angus Reid online poll (conducted a few weeks before voting day) found 59% of British Columbians thought it was time for a change. It also reported that the NDP was leading with 45% compared to the BC Liberals' 31%. The polls going into the Ontario campaign were mixed, some showing the Liberals ahead, others the Conservatives. I am inclined to agree with Bryan Breguet's assessment that on a net basis the PCs started out the campaign ahead. But campaigns matter. Enter Tim Hudak to illustrate the point. He started off with a plan to create a million jobs, all hypothetical and to come in the future largely from the private sector. He then completely stepped on his message a day later by saying that he would destroy 100,000 current real jobs in Ontario's broader public sector. After 2007 job destruction happened everywhere in the western world and unemployment soared, including in Ontario, which is highly dependent on the performance of other economies primarily the United States. To respond to the economic crisis the U.S. adopted fiscal and monetary stimulus while the EU mainly encouraged austerity (similar in principle to Hudak). At the beginning of the crisis the unemployment rates in the two regions were similar. 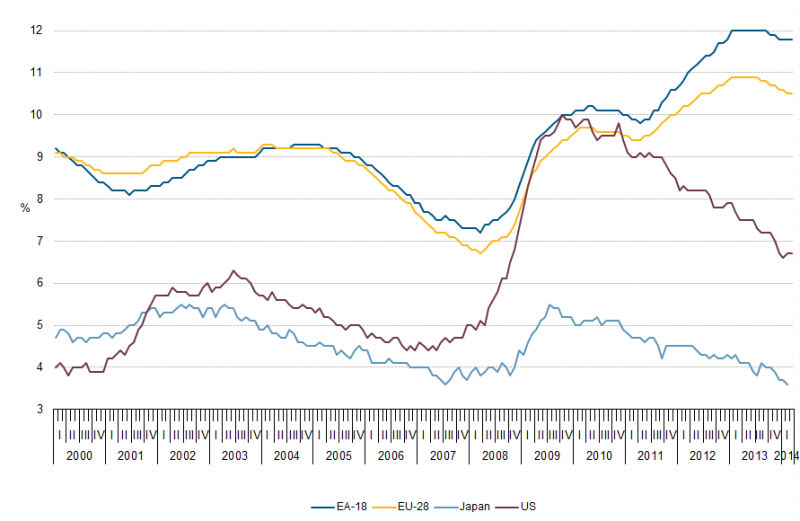 As this chart from Eurostat illustrates, the U.S. has performed far better on the jobs front than the EU. The blue and yellow lines are the EU 28 (all EU members) and the EU 17 (countries in the Eurozone), the line further down is the U.S., while Japan, which is currently the most stimulative of them all, is at the bottom. What has commanded more attention than Hudak's million jobs promise is his pledge to destroy jobs. A new Forum poll reports that 63% of the poll respondents don't believe the million jobs proposal - a hazard that any promise that appears to be too pie-in-the-sky risks. At the same time 62% disapprove of the 100,000 job cuts while just 26% like the idea. Even if Hudak wins his rhetoric was an error - he could have talked about finding waste and inefficiency, not flinching from making tough decisions, etc. Perhaps Hudak's plan will be the ballot question on June 12, not time for a change. The NDP has been trying to woo voters on the right for some time (although its profile on this has been fairly low), and today announced a plan for a new Minister of Savings and Accountability who would be tasked with finding $600 million in savings. For a party with a reputation for supporting big government, and not a good reputation for fiscal management, proposing to cut government by creating a new ministry simply seems ironic. It is probably at odds with the views of most New Democrats. When earlier this year a poll from Ekos research (see p. 10) asked with respect to federal politics if respondents preferred "Investing in social areas such as health, education or jobs", "Keeping taxes as low as possible" or "Keeping the deficit as low as possible", New Democrats were far and away the most likely to favour "Investing in social areas...", much more so than other parties' supporters and more than the national average. The same survey found NDP supporters as least likely to view cuts to public services as "necessary to reduce government waste" (p. 16) as opposed to seeing federal cuts as having "taken us to the point where the overall health of Canadian society is being seriously damaged". I am sure in the NDP planners' minds the announcement today about a Minister of Savings and Accountability is not inconsistent with support for spending on health and education, but I don't think their most active supporters will see it this way. It appears more 'Hudak/Harris/Ford keeping taxes and the deficit low', rather than making room for social spending. It is as the latter that the NDP planners likely prefer it be seen. In TC's view the most likely impact of the new announcement will be to drive NDP votes to the Wynne Liberals.